From Bloemfontein take the N6 to Aliwal North. In Aliwal North turn left onto the R58 travelling via Lady Grey to Barkly East. 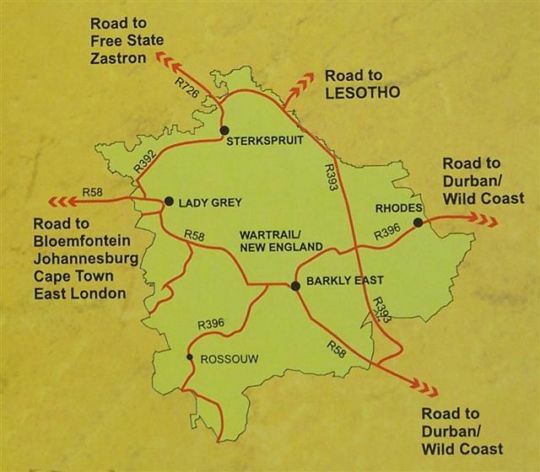 In Barkley take the R396, a gravel road, to Rhodes. Drive straight through Rhodes onto the Naudes Nek/Maclear road. 1.6 km out of town, having passed the Tiffendel Ski Resort turn of on your left, carry on for 500m and turn right where the Kinmel Mountain Retreat sign board indicates.